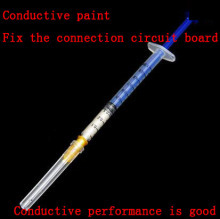 conductive silver paint sellers in the packaging when the needle is easy to use, the needle of a needle, it is easy to doubt, don’t use directly with the needle, in use process, can take the needle, to squeeze conductive silver paint, use a needle or comparative fine items, click on a small amount of conductive silver paint, draw a line at bolt can be connected, note: after the line down, must be conductive silver paint dry before, such as ordinary conductive silver paint natural dry time is longer, to several hours, we launched the quick-drying type of conductive silver paint, very good to solve the problem. Mainly used to repair some inconvenient welding wires Such as repair the keyboard Or a very small soft wire and so on And so on..
1) excellent electromagnetic shielding effect. 2) for ABS, PC, ABS/PC plastic base material such as excellent adhesion. 3) 100% pure silver powder medium, with excellent electric conductivity. 7) good film-forming performance, no off powder, paint film is hard and durable. 8) product is not easy to precipitate layered, homework.